I'm back! Sorry for the brief hiatus, I've been crazy busy over here and have had a few technical difficulties along the way. But, all is good and I am back in action! I'm starting off with one of my favorite outfits for the holiday season. I have been swooning over all things black and red buffalo check lately, my shirt being only one of many. This shirt is actually a dress and can be worn very casually or dressed up like I've done here. As for my shoes, I highly recommend grabbing yourself a pair of these little pretties, they add such a cute flare to an outfit and are comfortable, but give you just the right heel to strut your stuff. They are the ideal combination of strappy heel meets block heel. Then I added some tule into the mix and how can one go wrong there? This midi tule skirt brings me back to my childhood tutu days and I am loving every second of reliving that. With a little pop of red lipstick this outfit is brought to life. I can't see how anyone could have a bad day while wearing an outfit as fun as this. Wearing this outfit brought me so much happiness. They do say "gotta look good to feel good". 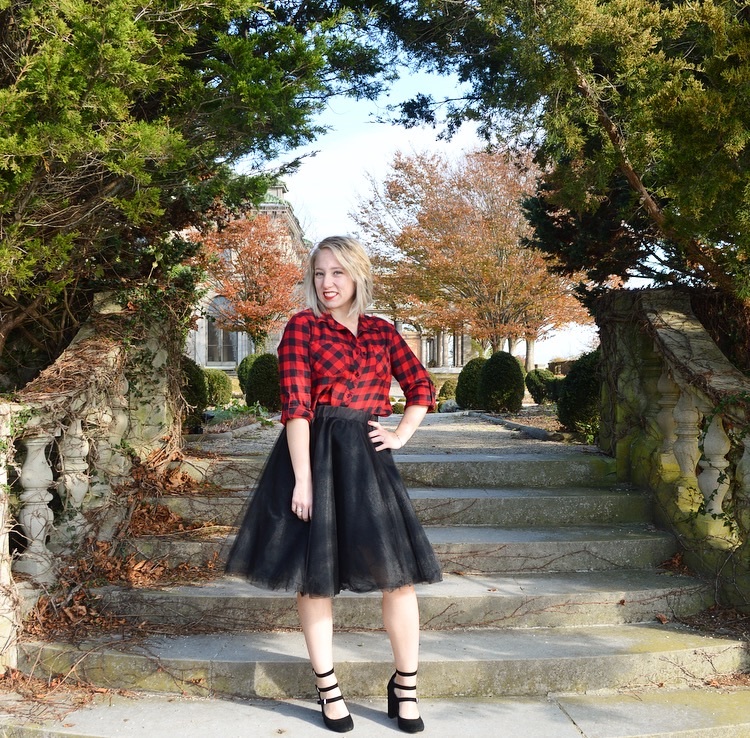 There is just something about tule, block heels and a plaid combo that wins me over, this look is the epitome of upbeat, stylish and holiday feels. It's an outfit perfect for a holiday party, a cookie swap or just for feeling F A B U L O U S!